I am popping in with a clean and simple Christmas card inspired by the almost closing MFT Sketch Challenge #356. I stamped and coloured images from several MFT sets (Beast Friends and Ewe are the best) and die cut them with the coordinating dies. I took a piece of patterned paper (Echo Park) and ran it through with a stitched rectangle die from a Blueprints set. I also die cut a stitched banner from dark chocolate cardstock to hold my sentiment. I white heat embossed Happy Christmas from a small Simon Says Stamp set, where the fonts were bold enough to fill the space. After adhering everything, I used a Spectrum Noir shimmer pen on the present and the Santa hat, and added some glossy accents. A few Doodlebug enamel dots finished this simple but cute card. I will upload this to the current MFT Sketch Challenge #356 and Simon Says Stamp Monday Challenge: All creatures great and small. This is my second post today, as I promised you Halloween cards until Halloween. So this is the last but one. I had the Newton’s Nook Designs Newton’s Costume Party set and didn’t have the chance to use it before. I wanted something rather simple, but could not decide which costume to feature. So I came up with a design which fits 3 in one card. I started with stamping and colouring the kitties and costumes, I used Copics and the coordinating dies to cut them out. Then I took a black stitched strip of cardstock and added a stitched scalloped green mat to it. After that I die cut 3 windows and placed my kitties in them. I backed it with a piece of vellum to mute down the background as the paper I chose was very vibrant. I white heat embossed a sentiment on a piece of bold coloured patterned paper (Doodlebug Booville collection still) and gave it a light blue stitched at before I adhered it to an A2 sized card base. A little bit of Spectrum Noir shimmer pen and glossy accents were needed to make this cute card even more special. I also used a black glaze pen on the eyes of the ghost costume. I will upload this project to the Simon Says Stamp Monday Challenge All creatures great and small. I hope you like it and will return for the last card in my series tomorrow. As it is Monday, I will have a little break from Halloween cards now and show you something special I made for Jana’s pulmonologist. It was totally inspired by the current Inky Paws Challenge #58 , that sketch gave me the idea of putting a circle tag on a card. I started with stamping the pretty ornament from the Newton’s Nook Designs Beautiful Baubles stamp set along with a circle sentiment from Simon Says Stamp on Copic friendly cardstock. I die cut it with a circle die and put it aside. I made several of these (more than I show here as I want to try more colour combos later), my stamp positioner was a great help with this. Then I looked for patterned paper. I am addicted to Doodlebug Designs paper pads and still have plenty sheets from last year too. I chose one in colder colours and one more pinky-red. I cut them down to fit the front of an A2 sized card. I also chose coordinating cardstock scraps and die cut a stitched strip. Then I coloured the ornaments in coordinating colours. It is much easier for me to select the patterned paper first and the colour accordingly, I almost all the time do this. I added some Spectrum Noir shimmer and glossy accent on the top. While it was drying I made some scalloped circle mats in coordinating colours, and backed them with a white one. I like to have my tags sturdy, the look more high quality this way. I poked a tiny hole on the top of the stand-alone tags and threaded through some silver string. I adhered the cards together using 3D foam tape under the tags. I also die cut tiny bows (Pretty Pink Posh) from silver cardstock and glued them on the ornament with a drop of Ranger Multi Matte Medium. A tiny little gemstone in the middle finished this cute set off. I will link this project to the Simon Says Stamp Wednesday Challenge Anything goes. I hope you like my project, and got inspired. 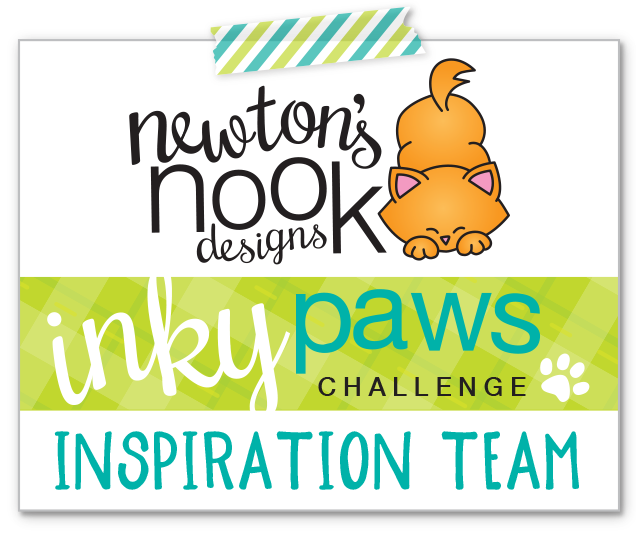 Come and play along with us at the Inky Paws Challenge till Friday 3rd Nov for a chance to win a 20 USD gift certificate to the Newton’s Nook Designs online store. Today I brought a card which needs a bit more time to prepare but a lot of parts can be easily replaced with less technique oriented solutions which can save some time. I started with stamping the images on Bristol Smooth cardstock and used my Zig Clean Colour Real Brush marker to colour them in. Then I fussy cut them (no coordinating dies unfortunately) and ran a Memento black marker around the edges for a more finished look. I had another piece of Bristol Smooth cardstock, I created a circle mask for the moon and sponged Wilted Violet and Black soot distress inks on it. When it was all done, without removing the mask I applied silver glitter embossing paste through the Starfield stencil. I set it aside to dry, meanwhile I inked up a scrap piece of cardstock with Black soot distress ink and die cut 2 grass borders. I sprinkled them with water for a more textured look. I also die cut a white picket fence (Lawn Fawn die) to add more dimension to my scene. When the background was dry, I removed the mask and used Black soot distress ink (really watered it down) to add texture to the moon. I was impatient and dried it with my heat tool, so I could stamp the sentiment and the bats on it with black ink. After I assembled the card, I added some glossy accent to the eyes and mouth of the pumpkins. I will upload this project to the Cat Lovers Blog Hop and to the Simon Says Stamp Wednesday Challenge Anything goes. I hope you like my card and will come back tomorrow for more Halloween fun.